So you’ve tried the version.txt hack and it didn’t turn out well (in short, it didn’t work for you). It’s admittedly a hit or miss bypass since not all games relied on checking a version.txt file to see if you were running the right firmware version. To date, the best and most reliable way to be able to play games that require OFW 5.03 to 5.50 is to upgrade to 5.50 GEN-A/5.50 GEN-B (no luck for partially hackable PSPs). But what if you had a game that requires 5.55 or 6.00? Well, there’s this method. Important Update: This guide has long since been outdated by Sony’s recent patches, to play the latest PSP games, you need the Prometheus module. You can find the install for 5.03 GEN-C, 5.50 GEN-3, 5.50 GEN-D4 and 5.00 M33 linked here. Important Note: This is ONLY for PSP users who have the following custom firmware installed: 5.50 GEN-A, 5.50 GEN-B, 5.50 MHU, 5.03 GEN-A, 5.03 MHU and 5.00 M33. If you have anything below this, consider upgrading. Update: Added Eboot Patcher for people running 5.00 M33, 5.03 GEN-A, and 5.03 MHU. A PSP with any of the following firmware installed: 5.50 GEN-A, 5.50 GEN-B, 5.50 MHU, 5.03 GEN-A, 5.03 MHU and of course 5.00 M33. Important: Go to File > File lists > Export and save it as game.txt. Go to PSP_GAME > SYSDIR. You should see an eboot.bin file. 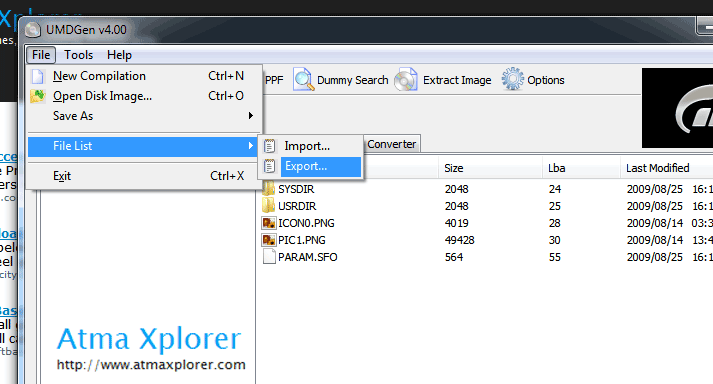 Extract the files for Game Decrypter to your PC. 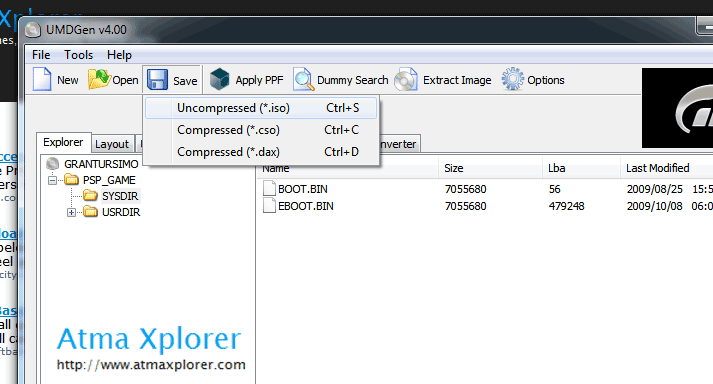 Copy the PSP folder from the extracted files right into the root of your memory stick. Note: The root of your memory stick is the actual drive your PC sees when you connect your PSP. Connect your PSP to your PC again. At the root of your memory card, you should see a new folder called DECRYPTOR. Copy the eboot.bin that’s inside it to your PC. Download and extract the Eboot Patcher (Mirror 1). On your PC, Add the newly decrypted eboot.bin into the SYSDIR folder that’s on UMDGen by right clicking on the right pane, Add > Add files. Import the game.txt that you’ve extracted in step 2 via File > File List > Import. Your game should work now. Important: Make sure you delete the Decryptor folder on your PSP before trying to decrypt a new game. Help! I’m getting just a black screen when playing a game hacked with this method. You have a game that’s not compatible with this method 🙁 Either that or your missed a step. 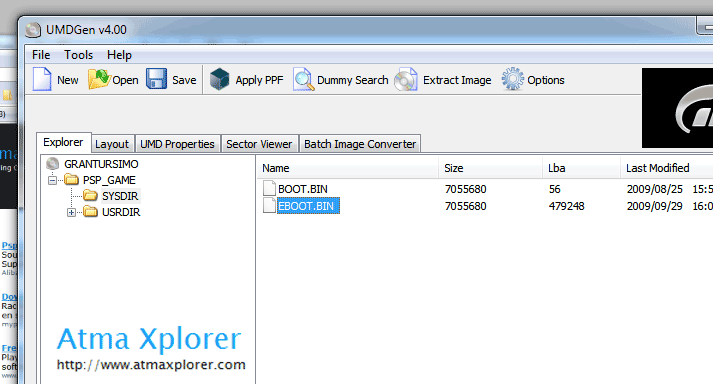 Try to look for an eboot.bin file, skip to step 9 and test it out if you want. What games have been tested with this method? Yoshihiro, Team GENyUS, and everyone else over at PSP GEN. I don’t have a USB cable. Can I use card reader to copy files from PC to XMB and XMB back to PC for the decryption? Yep. That’s not a problem. pre, san ko maddl ung mga eboot.bin??? site link naman jan oh. Thanks for always updating us, for the psp news and other stuffs. anti piracy kaba pare koy?? bigyan na ntin cla ng ating kaalaman..
kc tyo ang mas my nakakaalam pagdating sa mga hacking.. I know.. Yun na ung version na nakalagay sa link. What do you mean by that?, please clear the things up, is this program really working? Yes it’s working. The link for Game Decrypter on the post is already the updated version. I try this already, but it doesn’t work for Naruto Shippuden Legends: Akatsuki Rising [MULTI5] because When I try to run the Naruto Shippuden Legends Akatsuki Rising [MULTI5] after doing this steps my psp screen becomes black and I can’t use the home button. does anyone knows the problem? My friend was able to get his non-EU Naruto Shippuden Legends working. I’ll him to post. but please post the link here, so that i can download the Naruto Shippuden Legends. will this work on older games like patapon 2 call of duty and such? how will i know that my psp is one of those motherboards? like Naruto Shippuden Legends: Akatsuki Rising!! and i can’t play it with my 5.00 M33 CFW. please tell me what to do, so i can play Naruto Shippuden Legends. u want the fixed naruto?? bcoz i cant give u here,,its prohibited..
i already email you, Mikulotksi. can i know what games(new) that requires 5.55 sys version? im using 5.50 GEN-A(full) bt the game like G.I. Joe i cant play it..
No. You just need to hack the games as indicated above. i have a new games that require 5.55 to work..
just installed 5.50 gen-b2 to your psp and go play with it..
all the games that require 5.55 frmwre..
hey Nuuu i email u..
i give the link to ur email..
yup Mikulotksi, I’ve already received it, thanks. When i ran the Game Decrypter, it says the file is corrupted. I already re-downloaded the file and it is still the same. Any help? is your psp is CFW?? or ur just missing a file..
will it not run on gen b? hello. help me, i’m already in NUMBER 7 but when i place the the EBOOT in the memory card and try to decrypt it, the screen says cannot decrypt games eboot. then i connect my psp to the pc the decrypted folder appears but its empty. what should i do? I missed a couple of steps… The post didn’t save properly when I added it this weekend 🙁 You can try it again now. It should work. I love how the first decrypter link is a zip full of BOOBIES. LOL. I saw it too. The link has been replaced with a new one. guys!. can i use this method to decrypt psx games so i can play it on my psp? hi. im a bit confuse with STEP 1 to 4. in step 1 you want me to open the iso/cso game in the UMDGEN, we can do this by open the UMDGEN then inside of it we just click the open then look for the path of the game but in step 2 you want me to do this “Go to File > File lists > Export and save it as game.txt” but if i do this there is no .txt game in the folder of my game thus i can’t see anything. so how can i save the game in .txt? in step 3 you want me to open the iso/cso game. does this mean i need to save 2 copies of the game? one in .txt and the other in .cso or .iso? coz if i have .txt this file does extract the EBOOT.bin appreciate if you could add picture on how you do the step 1 to 4. thank you so much in advance. *sigh* I knew I should’ve provided pics. I decided against it because I worded the instructions to be followed easily. Guess it had the opposite effect. Step 2: You just need to export the file list to a text file. It’s not a copy of the contents of the UMD, it’s just a list of files. As indicated in the screenshot that I’ve just added, you can name it anything you like and place it anywhere you like. I just chose “game.txt” by default so you have something to name the file with. You will need this file in Step 12. Step 3: I said you just need to reopen UMDGen THEN load the ISO again. GT won’t work with 5.00 M33. I’ve already tried it and I was forced to update to 5.50 GEN-B2 just to play it. Right. Guess I have no choice but to upgrade to GEN then..
can i upgrade my psp 3000 5.03 gen A to 5.50 gen A? can i still download games? No. You’ll just brick your PSP-3000. Updated the post with complete pics. thank you for the pictures. i will try to do the procedures this weekend. mwah! I am having the same problem. What did you do to fix it? HI. im wondering, if you say that the games above are working now, do you have that games that are working so we can just download it and play it, instead of doing the procedures above? sounds lazy, just a taught. maybe you have a site that we can download those hacked games. thank you! I’m uploading some of them (at the moment Gran Turismo for 5.50 GEN… I’ll be uploading a version for 5.00 M33 afterwards) as a matter of fact :D. Head to this post for the latest updates. I did this on my PSP 2004 with chickhen r2 + 5.03 M33-6 but cant get games to work. Tryd it with GT US+EU Dirt2 Tetrist mini. I think i want to go to 5.03 GEN-A because it all seems to work on gen’s but how can i do that? I had 5.03 MHU(cfw 3.6) before, then i tryd to install GEN-A but that didnt work, and MHU didnt load after that either anymore so i put M33-6 (CFW 3.5) on and that one did work again. Is there someway to uninstall the CFW’s out of the flash (0 it is afaik)? Which version of Game Decrypter did you download? I just updated the links a few hours back so I’m wondering if you downloaded the current one (version 4). Also, no. There’s no way for you to permanently install CFW yet. I know that i dont perma install CFW but when i tryd to install GEN-A it didnt reboot as it should so i thougt oke not working. Lets boot CFW MUH again, but that went to black screen aswell and had to pull out batery. So then i thought CFW maybe was still in some flash mem part cos you have to ‘install’ it first time, and because of that it might sat in the way for GEN-A. hi. i tried to decrypt disgaea 2 using the step by step above, then when i tried the game, the psp said the game couldn’t be started. i have 5.03 gen A full. in step 10 when i copy eboot.bin, i pressed YES, is that right? your highlighted NO in the picture above. so im wondering if pressing YES made the game not to start. please help me. what did i do wrong? i followed everything in the picture and instruction. also, there are to 2 EBOOT.bin in the game, one inside the SYSDIR and 1 in the UPDATE folder. which of the 2 do i need to extract in step 4 i know to made clear to extract ht EBOOT.bin under SYSDIR, just checking. another thing, can i delete the EBOOT.bin in the DECRYPTOR FOLDER and in the main directory before i decrypted the file? just checking if these are the reason for the game not to start. please help me. thanks in advance. waah! =,( i tried to decrypt gran turismo, it hanged and close. congratulation to me, my 5.03 gen A full was gone, and im back to 5.03. huhu. so sad… help me fix my problem,,,, thank you. *sigh* Just reinstall chickhen and 5.03 gen-a. As for your problems with the guide, turns out it was the game decrypter’s fault.. the older version (version 1 and 2) that is. It’s at version 4 right now (the links are updated) and it now fully supports every other CFW all the way down to 5.00 M33. what if i have a custom firmware 5.00 m33-6? will it work ? Yep.. Just be sure to run the part with Eboot Patcher. do i need to download that ? where can i run the eboot patcher ? 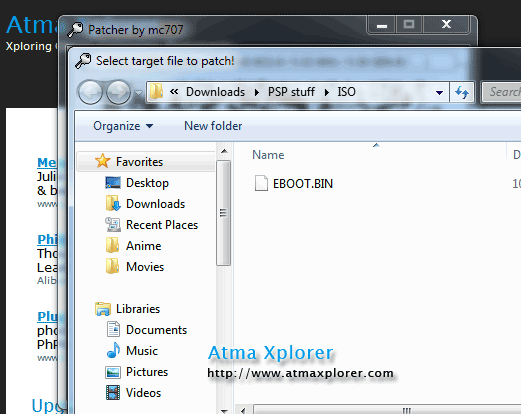 Eboot Patcher is meant only for people who want to play 5.55 and 6.00 requiring games on 5.00 M33, 5.03 GEN-A and 5.03 MHU. Thanks man.. U are a lifesaver.. Keep up da good work! the Eboot Patcher just won’t patch my EBOOT.BIN no matter how many times I try to do it. What error are you getting? I’m guessing that you’re trying to patch an eboot file that was already patched before. question: can I play the renamed ISO file that I’ve decrypted to another PSP so I don’t have to decrypt the game again? So long as it’s not a game decrypted on a 5.50 gen psp that you’re going to run on a 5.00 M33 or 5.03 gen-a one, you’ll be fine. My Tales ofVS doesn’t seem to work by doing this steps…. but when I tried it for my Disgaea 2, it works. g.i. joe, gran turismo, it couldn’t patched. y? i have 5.03 gen A full. i have a vista laptap, does vista allow dis kind of patch? That will work with 5.03 GEN-A. I’ll work on GI Joe. i also tried motorstorm, stil can’t patched. huhu. btw, in step 8, why do we have to press X and not O? if O can decrypt and patched Eboot.bin then maybe i don’t need to use the EBOOT patcher, just a thought. still need your expertise. please help. thanks, i have 5.03 gen A full and a vista laptap. Oh forgot about Step 8. I’ll edit that part. I dont understand step 5.Extract the files for Game Decrypter to your PC,but how?If I put psp folder to the root it will overwrite the original psp folder? *sigh* it will prompt you if you want to overwrite the files on your memory stick but since the CONTENTS of the folder you’re copying aren’t there yet you won’t be overwriting anything. You’re just basically taking a shortcut instead of individually copying single files to their correct directories. OK. Now I have a a problem with step 8. I cant decrypt.I pressed the o button,but it said cannot decrypt file.The folder is there but it is empty? I have 5.03 mhu. it still doesn’t patched. im trying to patch gran turismo. huhu. help me, what’s wrong with my psp or laptap? in step 8, if i press the O sine i have 5.03 gen A, do i still need to do step 9, patched the EBOOT.bin? coz in step 9, i can’t patched the eboot.bin please help me. Didn’t I give you the link to GT for M33 already? yes, but how can i patched other games if i cn’t patched GT. how can i succeed in patching the games that you mentioned above working. help me please? help me with my problem please. btw, does the game needs to be iso before decrypting or is it ok if it is cso? leaves a message and does not create any files in the folder. Oh. And one more thing: I’ve read that that for Persona, you’ll have to switch your “UMD ISO MODE” to “Sony NP9660” from the “M33 VSH MENU”… Remember in order to access this menu, press the “SELECT” button after your psp is booted up. I just tried this with SMT: Persona (USA) but the part with the eboot patcher won’t work. It always says that the eboot.bin is not patched. So i tried it without that step on my M33-6 and I got the game to start at least but after the intro movie the game stays black. I can quit the normally though. Anyone knows how to get SMT: Persona working on M33-6? hi! just downloaded umdgen but when I run it, it says “UMD generator has stopped working”… anyone who can help me? Hey i noticied you reply alot and know your stuff. One thing that has stumped everyone is trying to get fullmetal alchemist to work, can you? Thanks, I haven’t tried FMA so I don’t know if decrypting it will work but I do know that like the Evangelion game, it detects CFW preventing psps with CFW to play it. when im was saving it i got error..please teach me the proper way in step 12..
please help me in step 10..
Grand_Theft_Auto_Chinatown_Wars_USA_PSN_PSP-HR works on 5.50 GEN-B after decrypting eboot.bin by Decrypter V4. Hey guys,I have just installed 5.50 GEN-D Firmware,how can i get this to work? When i start the decryptor which version of psp should i choose?Should i press X or O? 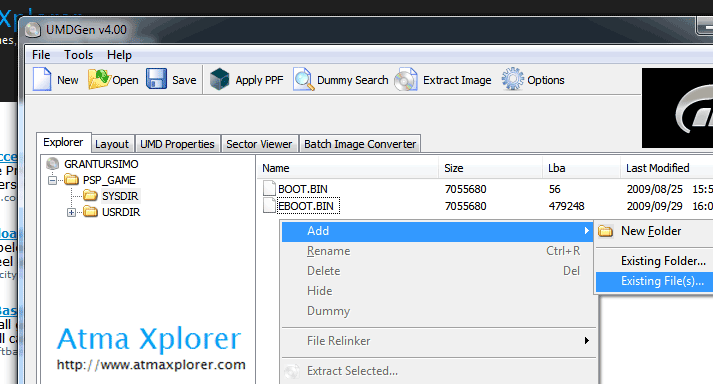 I pressed O,decrypted the file successfuly but then the patcher which you browse for the decrypted eboot.bin created a file named “eboot.bin.bak”(it’s in the same folder with the eboot.bin) Which file should i have to choose to replace the original eboot.bin in UMDGEN?eboot.bin.bak or eboot.bin? You don’t need this if you have 5.50 GEN-D.
Press and hold select until you see the VSH menu, change the UMD mode to M33 driver. Can i play GTA Chinatown wars with this method? When i try to patch the eboot.bin with the eboot patcher i get the error:The file Did Not Patched! The file you’re trying to patch has already been patched. hi…this page helped me alot…..im using psp2000 ..im using the method mentioned above..ive decrypted naruto akatsuke rising , Gran Turismo USA and some other games. (forgot the names too many )..well only once i failed . using psp 2000 is it ok to upgrade to upgrade my cfw 5.000 m33 to 5.50 GEN D? Yep. It’s actually a lot better to upgrade to GEN-D rather than decrypt games manually. hey can i upgrade from 5.50 MHU to 5.50 Gen D ??? if ..then how?????? Switch ka na lang sa 5.50 GEN-D2 or 5.03 GEN-B para di ka na dadaan sa decrypting stage. in short i cannot patch my eboot.bin so im stuck on the step 8. Hey im wondering can i go from 5.00 m33-5 to this version (Gen D) becuz i really wanna play Little Big Planet. Im wondering is it safe so it dont break my psp and is Yugioh Tag Force 4 patched? and can i convert back to m33-5 if i feel like it? 5.50 GEN-D is very stable and upgrading is safe (just don’t experiment, read the instructions carefully). And yes, you can still downgrade your PSP using the Hellcat’s recovery tool or something similar. err…tnx..na idecrypt ko na ipapatch ko na lang..kasi di ko mai-patch nung una..
pd na bang gamitin ang firmware na to sa PSP3000 with version of 5.50? kailangan ba lahat ng firmware na to iinstall sa PSP3000? Kapag mas mataas sa 5.03 ang firmware ng PSP-3000 wala pa magagawa para ayusin to at installan ng custom firmware. Hi…I’ve V5.55 PS3000. I followed all your steps but it did’n work. I’ve put EBOOT into the root but nothing appears. I don’t know hot to put for the first time the firmware…Could you help me please? Is Jak and Daxter working only in 5.50 CFW? Can I use this method in my PSP to decrypt the game files? salamat bro its help me a lot. I got a Persona orginal UMD that require 5.55. How do i play the UMD on my psp with cfw? (Psp slim with 5.50 gen-B) This method is for downloaded version of persona? Hey Chazz try to upgrade to CFW 5.50 Gen-D2, i can play persona without going through all this with gen-d2. The decrpyter will only work on PSPs with CFW. ok this is what ive been trying to figure out….Jikkyou Powerful Pro Yakyuu Portable 4…..tried the Eboot….doesnt go past the first loading screen…a message comes up with a loading screen and BAM blackscreen` any help? im in japan and its a little hard to find information. oh and the dl was a cso….am i fucked because i dont have the original ISO? I just upgraded to 5.50 GEN-D3 and my persona still doesnt work. Is it okay to proceed with the decryption using this firmware? Hmm that’s weird. Yep you can proceed to decrypt it. I tried and it won’t work, I jst downgraded back to GEN-B and the decrypter still wont work, it says “unknow blah blah with a :(” LOL. The PSP is still safe and sound though. i have a psp 1002 with 5.00m33-6. That happens with games that have already been decrypted. Either upgrade or find an untouched ISO.